4.52 points at 33 votes (rank 804). Rombachs C64-Spieleführer 8 September 1984 - "Vote 2"
"The Peanuts" is one of the most successful comic series in which the American author and illustrator Charles M. Schulz (1922–2000) describes the inconsistencies of human life by means of a group of US-American suburban kids, being released in daily strips over decades. Next to Charlie Brown, who is shown as the everlasting loser and is in a certain sense the main character of the Peanuts, Snoopy, Charlie Brown's dog, is the probably most well-known member of the Peanuts. He only behaves species-appropriate. Most of the time he lies on the roof of his dog kennel and abandonds himself to philosophical thoughs while waiting for the food. 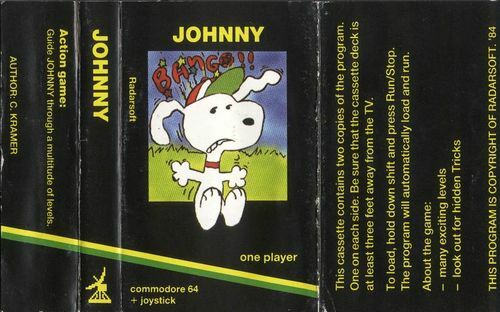 In 1984, he was dedicated an own C64 game with "Snoopy" a Jump'n'Run with a simple game principle. A game from a time when Jump & Runs found their feet, it is about steering Snoopy through 20 tricky levels. If you have made it, you restart at level 1 only with higher speed. The obstacles can be simple holes, moats, laser beams and more. The graphics is still simple for 1984, the levels are painted a bit lovelessly. Concerning the sound it is hardly any better, when Snoopy moves you hear scuttle steps, when jumping there is a sound, approx:"huiu-huiu", as a background sound the tune from the movie "The Sting" is synthesized in the sound processor. The controls are very simple. Moving to the left and right is done by the joystick movement, jumping is done with the fire button. Sledgie: "I am not that severe, the game is also useable for the old retro-fan of 40 and up. Furthermore it looks quite nice. However, in the long run it is boring or even unnerving. I give 4 out of 10 points." Borna: I admit that I have played it until I was through. Therefore an absolute highlight for me. FXXS: "Collision query is faulty, music is of one voice and unnerving... even at that time there were better games (Boulder Dash is also from 1984!). From me 3 points." Rombachs C64-Spieleführer: "Here also counts, as in many other programmes, in which you need to overcome obstacles, that only persistence leads to the goal. As in this game the curiosity for the next really intelligently made obstacles outweighs the frustrational emotions, one can only refer to the game as successful. (September 1984 - vote 2)"
blubarju: "Exactly, Rockford! If we looked at the game objectively, then 3 points would be the highest of highs. But also I liked the game and still like it. It is uncomplicated and simple. So ideal, to relax properly." As no cover of "Snoopy" has been found yet, here the cover of the French?? version. As there is no score in this game, it is not possible to make a highscore. This page was last modified on 23 November 2014, at 17:25. This page has been accessed 7,831 times.